At the screen, it prompts you to press the start button. When you hit the start button, it requests you to allow it to go to a certain web address. Allowing the request will close the application and will directly take you to a website entitled “Zuru” which explains what the Zuru service is about. In a nutshell, Zuru enables you to discover tourism destinations in Kenya and helps you explore them. At the homepage of the website, there are several tourism sites shown. When you click on a tourism site, it gives a brief description about the place, its category e.t.c . Also at the homepage, there is a search bar at the bottom of the page of the website that enables a user to search for websites. Another good feature about the website is that there are tweet and Facebook share buttons which enable users to share the tourism sites to Twitter and Facebook. At the specific sites which have been clicked, at the button of the page, there is a comment area where you leave your name, email, phone and comments about the tourism site. 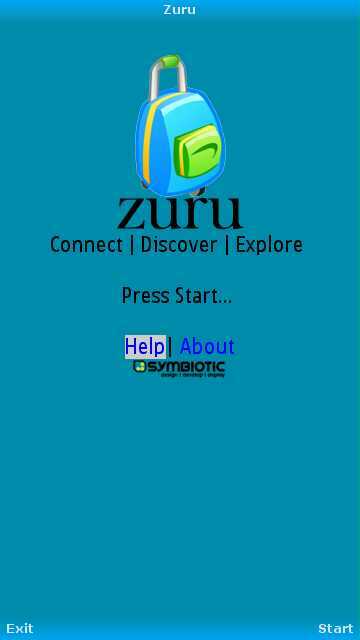 All in all, the Zuru app by Symbiotic is an example of a link app which directs you to a dedicated website which provides certain services. I recommend this app to tourists or frequent travelers who want to know various tourist destinations around Kenya. Legit is the second app by Symbiotic. Legit is an app that offers a service that ensures you have access to legitimate and qualified professionals and service centres. Its logon Screen looks like this. When you hit the LOOK UP button, it connects to the internet and loads this next screen. In short, legit is a useful app for locating business and getting detailed info about them. Its therefore recommended to all.